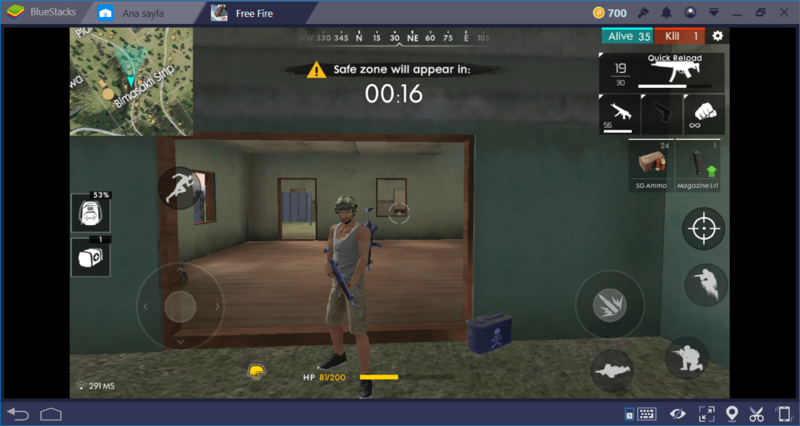 Managing your inventory is important in Free Fire since weapons are the most space-consuming loot, they play an important role in terms of inventory management. There are 18 different weapons in the game and each weapon is more appropriate for a different purpose. For example, some of them are much more useful while in buildings. 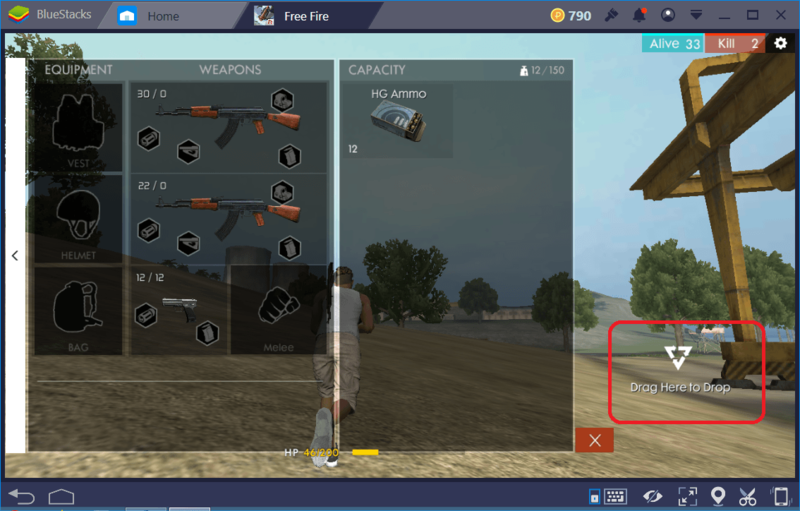 Knowing which weapon to use and which ones to carry is of great importance in Free Fire: This knowledge will increase your chances of survival greatly. In this guide, we will talk about weapons in Free Fire and provide some recommendations in terms of their use. You have three weapon slots and you can equip three different weapons at the same time. The ones you don’t equip will be placed in your inventory. You can switch between equipped weapons easily, especially if you are using BlueStacks. Basically, you get a slot for a primary weapon, a slot for a secondary weapon, and a slot for a sidearm. Only handguns can be placed in the sidearm slot. Primary and secondary slots are free to all kinds of weapons. In fact, you can even equip the same weapon for both slots. Your goal is to create a balanced set of weapons, which can be used in different combat scenarios. Basically, you should equip a weapon for long-range combat, another for medium-range combat, and one more weapon for close-ranged combat. This is the ideal setup but it won’t be easy to reach this goal: At the beginning of the game, you will be running around with only one weapon equipped. And that weapon will be the first one you found. This is why you should aim for finding more weapons and stay away from combat during the early stages of Free Fire. Once you create the perfect setup, you will be ready for the end-game. All of the handguns can be found on the island. 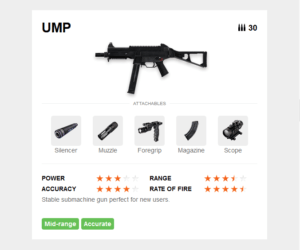 USP is the better choice here, since it provides support for silencer and muzzle attachments. G-18 offers more rate of fire, but it lacks any useful attachment. Desert Eagle is powerful (as powerful as some sub-machine guns) but it has a limited clip size and very low rate of fire. To tell the truth, handguns in Free Fire are not of great importance and they are used only as a last resort. So do not focus on finding the “best” handgun, they are not that useful. Both sub-machine guns are exactly the same in terms of damage and rate of fire. Think them as upgraded versions of handguns. We recommend skipping sub-machine guns: They can be placed only in primary and secondary slots and do not offer a practical use. They are pretty much useless in the open world and there are much better weapons to use inside the buildings. Use them if you can’t find anything else but switch them as soon as you find another type of weapon, such as assault, shotgun, or sniper rifles. For long and medium range combat, SKS and M14 are the better options. SKS is practically a sniper rifle: It comes with a pre-attached 4x scope. M14 is the assault rifle with the longest range and you can attach a scope. These are high damage rifles that are useful both in long ranged and close-ranged combat. While outside, you should always use one of these assault rifles. Groza is actually the best assault rifle in the game, but it can only be found in airdrop crates. M1014 and M1873 are shotguns. M1014 is the better option because it offers an increased rate of fire. Shotguns are the best weapons to use inside the buildings and clear rooms. For close range combat, always prefer a shotgun. M249 is a heavy machine gun that can be only found in airdrop crates. It is a useful weapon for close combat too, but shotguns can be found everywhere on the island and once you find one, there is no need to pursue M249. M79 is a grenade launcher which is perfect for clearing rooms without going in: Shoot a grenade through a window and kill everything in the room, simple as that. Sniper rifles should only be used for long-range combat. They are pretty much useless inside the buildings. 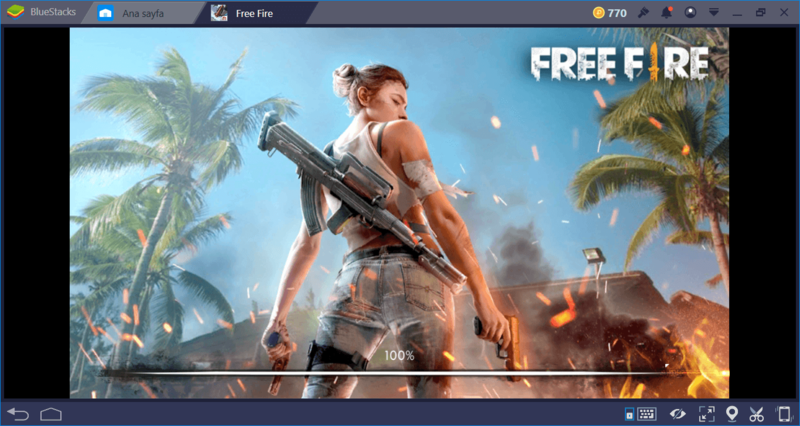 Remember that BlueStacks offer a “Battle Royale” mode for Free Fire, which adds mouse support to the game and makes using sniper rifles much easier. 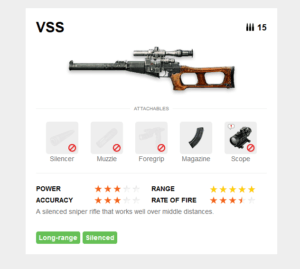 VSS is the weakest one, but it is also the best sniper rifle for beginners. 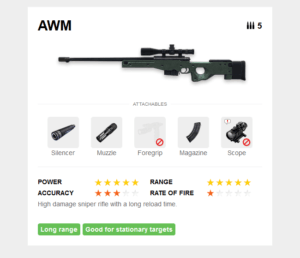 It offers an amazing rate of fire and a very long range. If you are a “professional”, however, AWM is the best sniper rifle. Unlike Kar98k, it supports magazine attachments, which means you can increase the clip size. However, its reload speed is very slow. If you miss your shot and the enemy spots you, switch to another weapon for defense. Otherwise, you will get killed while trying to reload AWM. You cannot create this setup always – the majority of your matches will end with less than ideal weapon sets. Luckily, this applies to other players too. Nobody will be able to form the perfect setup each time. You must work and fight with what you have. However, you know which weapons are worth switching now. You also know which weapons to take and which ones to leave: The rest is up to your skills. Good luck! It has been a while since we created this guide, there have been several game updates since then. 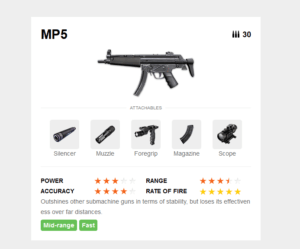 Check out the updated version of the Free Fire Weapon Guide here.